My first look at Redheads Studio was something different to what it is now – but the philosophy is the same. Small scale winemakers have a place to do their thing without having to have all your own winery equipment and you can get advice from full time winemakers. The small scale allows winemakers to do things that the large wineries would not even attempt. Thus there is the potential to find some hidden gems in such a place. 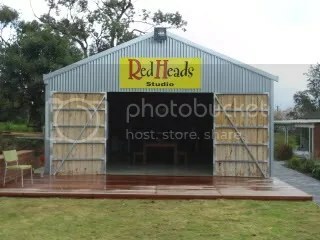 Redheads Studio is on Chalk Hill Road in the Loom Wine complex. It seems like they are still organising their opening times but the intention is to be open 10am to 4 pm on most days. They are looking to produce some smoked small goods from the Birkshire Pigs being raised on the property and these will be available at the cellar door soon – just another reason to pay this interesting cellar door. Grapes from a McMurtrie Vineyard and has been aged in French & American oak and has just won an award in it’s first outing. This is classical McLaren Vale Shiraz with typically wonderful fruit characters of plums and black fruits. The oak is well balanced and has an excellent acid length to the palate. The tannins are a pleasantly grainy and it just makes me think about a thick juicy steak. Andrew Pieri has a vineyard at the far end of Foggo Road between McLaren vale and McLaren Flat. The vineyard sits on sandy based soils and is making styles of wine that are true to his Italian heritage. This is an amarone style where the Shiraz grapes are air dried for about 2.5 to 3 weeks. The grapes are lightly misted with sulphur water to ensure mold does not cause issues. The grapes lose at least 50% of their weight – thus concentrating the sugars and flavors in the grapes and thus the wine. The wine is different right off the bat. The aromas are concentrated plums, currents and cardamon spice that has a meatiness to it at the end of the aroma depth. Speaking of depth, the flavors just show so much structure. There is a sweetness to the palate that has such a structured and complex spice mouthfeel. There is oodles of lingering everything here – certainly a WOW factor. I suspect this wine is different enough to not make all red wine consumers happy, but I say bring on the difference. In terms of food – well one needs full flavors and structure, so maybe try this with some blue cheese. Made the classical Ripasso style and from Shiraz grapes. Unlike the amarone style above I have never had this wine style before. This wine creates difference by taking the red wine from last year’s vintage and pass it through this years skins after they have been pressed – talk about a point of difference! The wine was aged in older French & American oak so oak is not a dominate factor. The aromas showed strength of plums and currents. The strength of the fruit was not expected – particularly as these aromas were not jammy. The flavors were an interesting contrast of some bitterness (from the skins), sweetness and drying tannins. The fruit flavors are in line with the aromas, so the Shiraz-ness is true. Drink it with just about anything but just drink it to try wine of this style. Adam makes wine that I am consistently impressed with. He has managed to get his hands on old vine fruit – in some cases 80 to over 100 year old vines) and has a simple wine structure. Make a Grenache wine and a Shiraz wine. Take the best barrels into the Reserve wines and the rest goes into the blend of the 2 varieties. The blend has turned out to just a wonderful wine as well – sounds like a win – win situation. I have previously reviewed these wines so check them out at La Curio Review. Also available but not tasted were the Stamfords and Clark & Longwood labels. 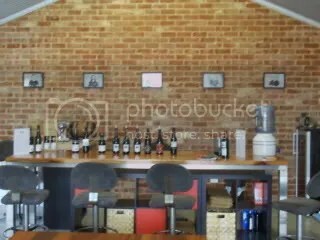 This entry was posted in Mclaren Vale, wine and tagged cellar door, Mclaren Vale, McLaren Vale Wine, Shiraz, Small Producer, wine, wine McLaren Vale. Bookmark the permalink. Have they moved? I found them in McLaren Vale in 2009 on the corners of Tatty and Foog Road – but the property looked nothing like the photos. 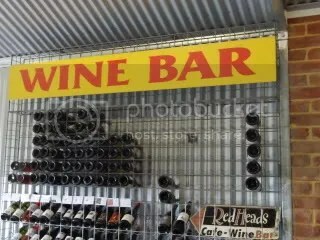 I bought some Back Shed Shiraz/ Grenache from them and picked up a couple of the Lazy Ballerinas (an ’06 Shiraz Viognier and a straight Shiraz IIRC). Love their work. Recently introduced myself to one of Mr Hooper’s La Curio Le Nobile or is it Nubile? Absolutely adored it….. Yes Stu they have moved – the old Red Heads is now Ekidna Wines, who are also running a restaraunt (tapas & pizza I think) and brewing beer.